Does your dog pull while walking? If so, you know the feeling all too of heading out the door for a nice walk only to be dragged around, making the walk feel more like a game of tug a war. If your dog tends to pull, wearing a standard neck collar can cause damage to the delicate throat area while wearing a back-clip harness will not help prevent the problem of pulling. You might wonder why your dog is pulling in the first place. Is it to reach that favorite pee spot or the faint smell of food in the distance? Surprisingly, it’s not just that. Every dog has an instinct to pull called “opposition reflex” which is the reflex to pull against pressure. When you are pulling your dog back, their instinct tells them to pull harder in the opposite direction. So, how can you make walks with your best friend safe and pull-free? Enter the PetSafe® Easy Walk® Harness, an effective solution that gently discourages pulling. Here are 6 ways an Easy Walk® Harness can make your daily walks easier. The Easy Walk® Harness features a martingale loop that rests on the front of the harness, making it easy to gently steer your dog to the side. The front-clip loop gives pet-parents more control while on walks and when they attempt to pull, their attention is redirected to their owner. 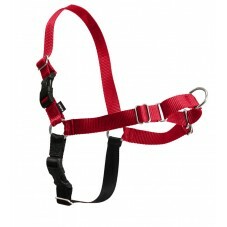 The unique martingale chest loop reduces gapping and twisting of the chest strap, making walks tangle and stress-free. When a dog pulls on a standard neck collar, they may make a choking sound as they are pulling on the leash. This choking sound is a result of too much pressure on the delicate throat area and could lead to neck injuries, a crushed trachea, damage to the larynx, and much worse. The Easy Walk® Harness sits across the chest and the shoulders, preventing choking and damage to your pup’s throat and neck. When selecting a harness, finding the proper fit can be challenging. However, the Easy Walk® Harness features 4 points of adjustment making it a great option for dogs of any size as it is fully customizable. Taking the time to properly fit the harness will ensure your dog is comfortable and the harness works properly. Read how to properly fit your Easy Walk® Harness here. The Easy Walk® Harness fits easily on nearly any breed given that it sits across the chest and not the nose or head. It is particularly helpful for brachycephalic breeds such as boxers and pugs because these breeds can have difficulty breathing under stress given their shorter noses. A harness that does not put pressure on the throat will help keep these pups healthy and comfortable. Unlike a neck collar with only one buckle, harnesses can take more time to put on pups. However, the Easy Walk® features Quick Snap buckles on both the chest and shoulders, so you can easily put it on and take it off. The belly strap is also a complimentary color making it easy to tell which strap goes over the shoulders, and which strap goes under the belly. Do you live in a busy area and worry about walking your pup at night? The Easy Walk® Deluxe Harness features reflective strips to help alert drivers or other pedestrians where you are walking your dog. The reflective strips are also great for taking your dog to the park or anywhere else after nightfall. 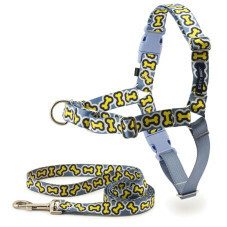 The PetSafe® Easy Walk® Harness is available in multiple colors including solid colors, patterns, and bling versions. Visit the harness section of our website to find your perfect fit.